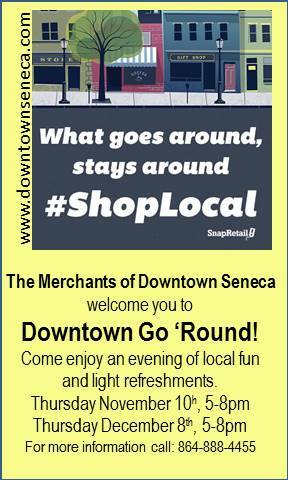 The Merchants of Historic Downtown Seneca welcome you to Downtown Go 'Round! Come out and show some love for the fabulous local shops Thursday November 10th 5-8pm and Thursday December 8th 5-8pm! Downtown Go 'Round is a fun event for locals and visitors alike. Stores stay open late and offer complimentary light refreshments! Be sure to come on out and support the wonderful local businesses of Downtown Seneca!